For a limited time only, Annual Pass Holders can enjoy 60% OFF Adult tickets with the Zuper Saver Bundle! Simply flash your Annual Pass at our Ticketing Counters and purchase 3 Adult admission tickets at only S$42 (U.P. S$105)! This promotion is valid from 1 January 2019 to 31 March 2019 for KidZania Singapore Annual Pass Holders only. 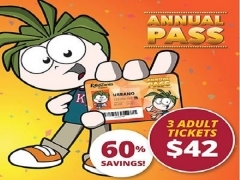 The Annual Pass Holder must present the physical Annual Pass card at KidZania Singapore Ticketing Counters to enjoy this promotion. This promotion is only valid for the purchase of three (3) Adult admission ticket purchase via walk-in at KidZania Singapore Ticketing Counters only. The three (3) Adult admission tickets will be valid for three (3) months from the date of purchase with no further extensions or revalidation to the date and can only be used at KidZania Singapore. The three (3) Adult admission tickets can only be utilised when accompanying an Annual Pass Holder on the date of purchase and for future visits. All Adult admission tickets sold must be used by the date stipulated on the ticket, and are non-refundable, not for resale, non-replaceable if lost or stolen and will not be valid if altered or damaged. All Adult admission tickets sold cannot be exchanged for another Ticket type.